Some odd things occured pertaining to land ownership on P.E.I. during the 1800's. The following is an interesting record, taken from a page of the 1867 "Parliamentary Reporter". Here, we listen in on a discussion ongoing in the government house, pertaining to Mr. Elsha LePage, a gentleman incarcerated for 15 years for not paying rent for land which he owned outright. Perhaps we could title this "It Happened on P.E.I. ", and place it in "Ripley's Believe it or Not"! LePage was Garth's third great-grandfather. Hon. Mr. HENDERSON:-- Had the good fortune to be ignorant of the law, in so far as his own experience went; he never was sued or had occasion to sue any man. He would like to know from the hon. member the leader of the opposition, whether there were, or had been such cases as those referred to since the introduction of Responsible Government, or within his memory? . Hon. LEADER OF THE OPPOSITION:--The hon. member had referred to him. He had already said that when a case was once fairly brought before a Court, and a jury passed a verdict upon it, that case could not come up again. Before a party could be non-suited he had to pay the whole cost of the proceedings. All he could say was, that if the clause was introduced, it would cause the Bill to be lost, because it would be putting one class in a different position from another. Such a course might be very popular, but it was only deluding the agricultural population of this island. Hon. Mr. DAVIES:--We had been told that such a clause as the one he proposed, would only deceive the people of this island, but he would relate a case which would show the necessity there was for the clause he had introduced. Elisha Le Page, at one time of the firm of Le Page and company, a respectable mercantile establishment of this City, who, after experiencing the fortune attendant upon some of the earlier adventures of trade in this Colony, settled down as a farmer at Rustico. A plot of ground, held by a descendant of one of the French families, who had settled on the island long before it had been ceded to the British, had been seized for dept., and was sold at Sheriff’s sale in Charlottetown, and bought by Le Page, who for some time continued to improve upon it. In the meantime, it would appear, that the proprietor of the Township, not satisfied with what he had in possession, proceeded by threats and persecutions to frighten the settlers, most of whom held their lands from father to son, for more then a century; and independently of this claim, the French settlers on the island, at the time of the conquest, were guaranteed peaceable and quiet possession of their holdings and under the faith of the Royal Treaty they remained satisfied and felt secure. At the time of , which he spoke the people were illiterate, and were easily frightened, and he might add, were compelled to take leases for the very lands of which they were in right the freeholders. It was while these nefarious proceedings were being carried into effect, that Le Page came in contact with the proprietary agent, who demanded rent from him for the piece of land which he had purchased at the sheriff' s sale. He ordered the agent off the farm, and soon after received a summons to court on an alleged plea for the recovery of arrears of rent. He did not appear in Court, and judgment was given against him by default, consequently, Le page was committed to jail. Doubtless the object they had in view in committing LePage to prison, was for the purpose of coercing other settlers to take leases, and to acknowledge the supremacy of the land claimant to the Township. It had to a great extent the desired effect, for the French settlers, who refused to comply with the iniquitous demands previously made by this land claimant, were told that if they held out any longer against this demand, they would be placed in jail alongside of LePage! This man was well known in the country, and supposed to have considerable influence in Town; they were therefore led to see what their fate would be if they continued to resist the aggressor. Thus by terrorism skillfully kept up, the proprietor and his agent did succeed in consummating their villainous plans in wrenching from these poor people their freeholds; and every person in the country at the time, from the Lieutenant Governor down to the lowest bailiff, knew how unjust it was, and were aware of the means used to accomplish this base end. All this time poor Le Page remained in jail. Offers had been made to him from time to restore him to liberty, on the condition that he would acknowledge himself a tenant and take a lease; and they graciously offered also, to release him from all arrears of rent. These terms he would not accept, and said he would die in jail before he would give up his land which he had honestly bought and to which they had no right. Thus LePage remained in jail for about seven years. Hon. LEADER OF THE OPPOSITION:--He was in jail fifteen years. Hon. Mr. DAVIES:--Yes, but not at this time. Well, he was released then on account of a general jail delivery, when all debtors at the time were discharged in consequence of certain Acts under which they had been committed having expired. LePage returned to his estate and family, but was not left long to remain in his lawfully obtained home, for soon after he was again cited to appear at court in an action for arrears of rent. He said that he had bought his land and paid for it, and would defy the Court or the proprietor to take it from him; and with an extraordinary stubbornness refused to attend Court, and judgment was obtained against him, not only for the arrears that had accrued since his first commitment, but also for the first alleged debt which had been discharged, and poor LePage was again re-committed to prison. Such were the facts, and any person having doubts as to their correctness, would do well to satisfy himself by a reference to the records of the jail, where he would find the entries. Some few years since, he being on the Grand Jury, that body visited the jail. In surveying the apartments, he (Hon Mr. Davies) was struck with the worn out and haggard appearance of one of the prisoners, and asked the jailer who he was, when he was told that it was LePage. Poor LePage had been forgotten by all his old acquaintances, himself among the number, several of whom held the first positions in the land; but they were of a class who had no feeling for any person who attempted to resist the proprietary claims, or for the man who would advise the descendants of the French settlers not to attorn to those impostors of land claimants. The Jury inquired how long he had been there? The jailer answered for over fourteen years, except during the short interval when a jail delivery took place, but he was soon sent back again, and. he added, (for obviously he sympathized with him) the poor fellow is failing fast, his faculties are giving way, and a few more months confinement will destroy his mind. The jurors all spoke to him; most of them knew his family and himself, and insisted on presenting his case to the Court. On their return to the Court the Jury presented this extreme case; but they did not get much for their pains. One of the gentlemen of the bar had the audacity to abuse the Jury before the Court, until the Court interfered and put him down. Some months after this, Le Page was released from jail; stating the whole case, which was to have been laid before this Hon. House. He was released, but whether by an order of the Court , or from fear of public exposure in the House of Assembly, he had not learned. Yet notwithstanding this and other glaring cases of oppression, where hundreds of freemen’s holdings were by coercion changed from freeholds into leaseholds by a system of tyranny unparalleled, we still heard impudent men declare there had been few cases of oppression on the part of so-called landlords. He was not a man who would screen any person from paying his just debts, but he would prevent men from imposing on upon their fellow men. Yes he would prevent those land claimants from ever again imposing on any man in this colony. He would not allow one man to trample upon the private rights of another, as had been so often the case, when those land claimants were permitted as they pleased without the shadow of a right or just claim to impose on the peaceful settler. He would not be satisfied until he got the people every right to which they were entitled. Hon. Mr. DAVIES rose to a point of order. This amendment did not refer to the tenantry at all. It had nothing to do with them. It referred to those who had settled upon a piece of land, and when the case was called up in Court, and the plaintiff did not appear to show his claim, this amendment went to provide he might not have the power to sue him again on the same case. It had nothing to do with the man who had taken a lease at all. the necessity of avoiding as far as possible any steps calculated to excite unreasonable expectations or to stimulate agitation. On the other hand, while assuring the proprietors that the award of the commissioners will not be enforced by Her Majesty's Government against any persons who have not either personally, or by their representatives consented to refer their claims of arbitration I should wish you also to observe to them, that their refusal to concur frankly in a measure which was intended to compose existing differences, and so far as it had yet proceeded, had been assented by a large portion of their body, might materially influence the conduct of Her Majesty's Government hereafter to support them in any future disputes with their tenants. This extract had been taken by many of the people to signify , that in the event of disputes arising between proprietors and tenants, the British Government would not allow troops to be sent here to uphold the law. On this point the Lieutenant Governor, under date 23d March, 1865, requested Mr. Cardwell' s opinion, who replied: -A The meaning of His Grace (the Duke of Newcastle) evidently was that the Home Government would not advise the Queen to exert Her Majesty' s prerogative by disallowing Acts of the Legislature of P.E. Island, in deference to those who refused reasonable terms of accommodation when offered to them. There was, he held, in this extract a tacit admission that the British Government would not refuse it's sanction to any reasonable measure founded on the principle laid down in the dispatch. Hon. LEADER OF THE OPPOSITION had already twice told the hon. .member, that when there had been a fair trial, and a jury had passed verdict upon a case there could not be a trial on it again. If a person sued and neglected to attend, of course he was non-suited. Mr. HOWAT.-That did not mend the matter. Money was no object to some men. A rich man may put off his case from time to time, until he worried out a poor man. It was not for justice, or to obtain it that some men went to law but it was that they might conquer the poor man, and thus get the better of an opponent. He would again maintain that the hon. member for Belfast (Mr. Davies) was right. Talk about paying the costs !What did some men care for that; their object was to follow up the poor man until they accomplished their end in mastering him .He believed the amendment of the hon. .member was a proper one, and would support it. It was a principle of Law, that when a case was once tried and judgment had been passed upon it , that it could not be taken up again. But there were, and might be cases, where the ends of justice and right would be sacrificed by the adoption of the principle embodied in this amendment. Suppose a man to have a case, who found just as he was coming into Court, that a material evidence was absent, would you prevent him from bringing on his case again, if under these circumstances he were to withdraw it? He could not regard some of the arguments which had been produced other than mere clap-trap. When he heard such, he felt disposed to question the sincerity of those who used them. According to this resolution, no matter what the peculiarities of a case might be a man could not get a new trial. He had yet to learn that one principle was to be applied to land, and another to other kinds of property. In this absence of evidence, a man might lose a case though it was an honest and just one, at a subsequent time the evidence might turn up, but a clause of this nature would prevent him from renewing his claim and thus the legitimate ends of justice would be defeated. If the proprietors had not a proper claim to their lands, why did not the hon. member establish a court of each at, and take them from them. Until the Government did so, the proprietors were entitled to proper protection at their hands. The merchant, farmer, or mechanic might come into court and find that he had a material was f evidence wanting. If so he could by paying the costs withdraw his case, and when his witness forthcoming, would you throw his case out of court? If it was their intention to carry this resolution, let the thing be done handsomely, and in an honorable and manly manner, but let the Juris prudence of the Colony be disgraded. Admit this principle into Bill, and you would be injuring the poor man as well as the rich. The fact was, if the arguments of the hon. members who had supported the resolution were correct, then their ideas were in advance of the ablest jurists in England. He did not wish to act discreditably towards any hon. member, but he could not but say, that whilst such arguments might be poplar with some in the House and in the country, yet if the principle was once admitted, it would apply with equal force between all classes in the community; and he could assure the hon. member, that such a principle would apply very differently from what he anticipated. If adopted , it might apply in such a way, as would make the hon. member smart. Mr. HOWAT .could not agrees with the doctrine laid down by the hon. member for Charlottetown. Judging from what the hon. member had said, he would infer that lawyers looked upon it as a crime, to differ with them in opinion. The hon. member said that if a witness was absent, it would be an act of injustice to prevent a person from bringing on his case again. He (Mr. Howat) did not know much about the law or lawyers, nor did he wish to, but if he understood the hon. member correctly, he argued that if a man went to court, and found when he got there that an important witness was absent, that he could by paying the costs, withdraw his case; and when his witness returned, that he could renew it again. He would still maintain that this was wrong. Costs were not an object to some men, if he went to court he should be prepared with his evidence before he went. Mr. BREKEN The Hon. member had expressed an opinion upon a question, the principles and hearings of which he did not very well understand. You might have a case in Court, and your Counsel might regard it a very good one, but it might be that a point would quite unexpectedly turn up, and to sustain it might be of the highest importance to you, yet you found that the witness who could do so was absent. As the law now stood, you could make an affidavit to that effect and defer or withdraw it. The Court might grant a new trial; it was not however, in every case it would that it would do so. The clause sought to be introduced, referred to a certain class and ought to be rejected. The day for class legislation had gone by. Mr. BREKEN The hon. member for Tryon should not give an opinion when he knew nothing about the matter. Suppose an action brought against him, and that the party bringing the action produced in Court, to aid his case, a forged document- a deed for instance. The hon. member not being prepared at the time with evidence to prove that the deed was not genuine, might lose his case, and however direct evidence he might afterwards obtain, he could never have a new trial. The hon. member did not understand what he was contending for. the amendment proposed would, prevent his ever bringing forward the witness or document and having the case fairly tried. The amendment did not bear upon township, landlords only, but upon everyone, who might bring a suit about land, and he did not therefore see why any distinction should be made between their suits and actions, for ordinary debt.. He thought it rather premature to introduce this matter into the Bill before the committee. Notice should at least been given before hand, that hon. members might have had time to consider it. Though he was willing to support any measure which would aid in doing justice to all, he would oppose the amendment, since he did not think it could ever come into operation, and because it would probably imperil the whole Bill. It had better be introduced as a separate measure. Mr. BREKEN on considering the matter saw even greater objections to the proposed amendment than he had at first noticed. A Judge might take an erroneous view of the law, or a jury might, as was often the case, give a perverse verdict, and there would under the amendment be no remedy. He could cite cases from his own practice in which he had a new trial on such grounds. A Judge too, might be bribed by a proprietor, perhaps in a suit against a tenant, and no new trial could be obtained. Mr. HOWAT It was possible that the judge or jury might be right the first case and wrong in the second. Hon. Mr. Duncan thought that this fact that a party who brought a suit and was nonsuited had to pay the costs, was a pretty good guarantee that people would not often sue without a just claim .The cases cited by some hon. members might be reversed and a poor man be compelled to sue a rich one for his land. If the amendment became law, and he were to fail in getting justice the first time he would have no second opportunity. the case of Winslow vs. Doiron. In this case ,there were a great many old men as witnesses and they were brought to court from time to time for a number of years without a case being tried. Doiron at length obtained judgment, but his expenses were some hundreds of pounds. There was surely need of some remedy for such injustice. Hon. Mr. Davis had been misunderstood by many hon. members. His object in bringing in his amendment was to protect poor people from being constantly sued, and judgment perhaps obtained unjustly, because they happened to be absent, once people throughout the country would see who was anxious to promote their welfare and who was not. In introducing the amendment, he was simply endeavoring to remedy a grievance which the people complained of, and which members on both sides of the House had promised to remedy. It was folly to talk of his bringing in a Bill embodying this reform. Hon. members knew very well that tomorrow was the last day for introducing bills and it was impossible for him to bring forward one. There was nothing in the Bill which had been brought forward by the hon. leader of the Opposition that was really worth anything, except the amendment which he (Mr. Davis) had introduced. That amendment he intended to bear upon those cases in which a man brought an action for / and to which he had no title. If the words did not express this clearly, hon. members were bound to correct them. Hon. LEADER OF THE OPPOSITION was not aware that he was bound to connect the amendment of the hon. member of Belfast. He would do no such thing. Hon. Mr. Duncan- His hon. colleague should have thought of this matter in time to have brought in a Bill. Why might he not now ask the House to suspend the rule for a few days to enable him to to do so. Mr. Davies- If the principle was a good one why did not hon. members support in the Bill before them. Mr. PROWSE thought that another election was probably approaching, for the hon. member for Belfast ( Mr. Davies) appeared to bring forward this measure merely to gain popularity. It was strange that he did not bring in a Bill to do away with the rights of proprietors, and settle the quit rents. would be of any real benefit should it become law. Mr. REILLY would support the amendment if he believed that it would defeat the Bill before the committee, for he could see no good in it . When the time of the House was considered so precious, it should have been allowed to stand over. Hon. ATTORNEY GENERAL differed with the hon. member who had last spoke, as regarded the importance of the Bill. He could not support the amendment of the hon. member for Belfast, for it would be considered unjust to very many in the Island. Small proprietors, or anyone holding land, would be affected by it. A man might bring a just action, and from some error in fate perhaps be nonsuited from obtaining his right. The principle did not as some hon. members supposed bear on the case of Doiront. Hon. Mr. HOWLAN alluded to the case of a man at the west end of the Island, who had been harassed by being summoned to Court unjustly. Such matters should be remedied, and if the clause introduced by the hon. member for Belfast would not do so, it was the duty of hon. members to introduce some measure which would. After some further remarks from hon. members, the amendment was put to a vote and lost -Hon. Mr. Howlan , Mr. Speaker, Messrs. Cameron, Mc Neill and Howat, voting with the hon. member for Belfast. Progress was reported after which the House adjourned. Hon. ATTORNEY GENERAL then submitted a clause , which he thought would be supported by the hon. member from Rustico, and the hon. member for Belfast (Mr. Davies) It was to the affect that an absentee' s property should be liable for the expenses of any suit in Court when the judgment went against him. This clause would meet similar cases to that referred to by the hon. member ( Mr. Mc Neill ), namely that of Doiront, in which though he gained the suit, yet as Mr. Winsloe did not live on the Island, the costs could not be recovered from him although he had property worth thousands in the Colony. Hon. LEADER OF THE OPPOSITION had much pleasure in supporting the clause. He thought it was a very good one, and if it had been in existence soe years ago, Doiront would not have been put to so much expense. Mr. McNeill was glad that such a clause had been introduced into the Bill by the hon. Attorney General, and was supported by the hon. leader of the Opposition. IT could not however, remedy Doiront' s case now; he would not get over it as long as he lived. It was somewhat singular that though some ten or fifteen years had elapsed since that trial, no amendment in our laws to meet such a hardship had been introduced till now. The clause was agreed to. Monitor: Friday, Feb.26, 1858 - page 3 - Elisha LePage, imprisoned for debt since 1 May, 1849 in Charlottetown Jail discharged. 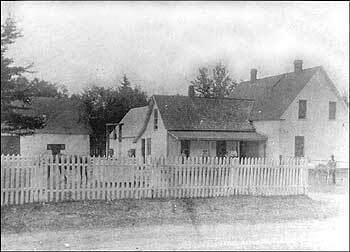 LePage homestead referred to in this discussion, photo taken in the early 1900's. Return to P.E.I. Land Database!